Fast deposits, smooth withdrawals and the ability to manage funds are just some of the advantages to using an e-Wallet. 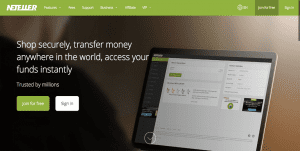 Neteller has been reviewed to be one of the best virtual wallets to make deposits and withdrawals with, and we’re here to explain why. When using Neteller at one of the online casinos in the table above, you will experience instant deposits and fast withdrawals, as well as confirmation all transactions made are secured. Hundreds of merchants accept Neteller as a payment method, but other web wallets such as PayPal are preferred for online shopping. When it comes to online gambling, hundreds of web casinos accept Neteller as a deposit and withdrawal method. This is why it is so popular for online casinos worldwide. While the web wallet is incredibly secure – we detail this below – you should only use it at secure sites. Just as you shouldn’t use PayPal at a dodgy online shop, looking to scam your money, you shouldn’t use Neteller at a rogue Internet casino. Fortunately, our recommended web casinos are all 256-bit SSL encrypted and ensure when you do use Neteller your funds will be used for gaming and won’t be stolen or locked. Has Neteller been around as long as Paypal? Neteller was established in the same year as PayPal and began accepting gambling transactions two years later. Its reputation is the same in the iGaming industry as PayPal’s is in the online shopping realm and therefore is a trusted method to fund online casino accounts. What’s more, players from all around the world can use the e-Wallet. To create an account, all players need to do is head to the Neteller website and register your details. This only takes a few minutes and all personal data is protected. From here, you can fund your account by linking a payment method with Neteller offering country specific methods, such as POLi for Australians, as well as worldwide recognised methods, such as Visa and MasterCard. Be sure to check for the fees involved, with bank transfers generally free to use – though this method can take up to five days for funds to appear. If you want a faster method, you may have to pay the fee but when you go to make a deposit or withdrawal at the online casino you won’t be charged a thing. Neteller is simple to use – you just need a funded account with the virtual wallet to use at any of the online casinos listed in the table above. You also need to be logged in to make a deposit at a web casino – sign up if you don’t have one by registering your details – and have the cashier open. You will be able to make a deposit by entering the amount next to the Neteller logo and clicking next. Follow the prompts, and enter your Account ID and Secure ID, created when registering for a Neteller account, and confirm the transaction. Funds will appear in your casino account instantly – provided there’s sufficient funds and you entered your details correctly. You can then get playing the real money casino games of your choice. Neteller offers fast payouts in comparison to other methods, besides the other top web wallet, Skrill. For example, 32Red Casino claims withdrawals are processed instantly when using Neteller. It is important to note these processing times don’t factor in the time it takes to withdraw from your Neteller account to your personal account. Making a withdrawal from Neteller to your bank account can take up to 10 business days, and all withdrawal requests come with an absurd $15 processing fee. One of our editors had a very negative personal experience when withdrawing using Neteller, and was hit with an additional fee on top of the $15 withdrawal fee that Neteller said was out of their hands. While we understand that fees will apply, being charged $30 to withdraw funds is not okay no matter which way you spin it. Given this large cost, we suggest you use another withdrawal method to avoid Neteller’s high withdrawal fees and undisclosed transaction charges. If you game on a smartphone or tablet you can also make a deposit using Neteller at the online casinos listed above. These casinos each offer mobile versions with a select range of payment options, including Neteller. Players can follow the same depositing prompts as they would on desktop devices, tapping in their details and confirming the transaction to fund their mobile casino account. No matter where you use the payment method, Neteller is incredible secure. The service guarantees all transactions will go through and are protected from fraud. Additionally, Neteller uses 256-bit encryption and firewalls to protect personal information. You can also make the service even safer by adding the Two Step Authentication on your Neteller account. It offers another layer of security, requiring an extra code, which is sent to your linked smartphone, to be entered along with your log in details. You can set it up via your personal Neteller account. Speaking of extra layers of security, Neteller is not only an option for a secure service it makes deposits and withdrawals more secure at web casinos. This is due to the ‘blanket’ it provides between your personal bank account and the online casino. Make a deposit with Neteller at 32Red.com and enjoy the regular promotions offered by the top online casino.